AKU update packs are installed by manufacturer along with firmware. There is no way to download it and thus patch current version of your software. New AKUs can be obtained only with new firmware, released by manufacturer. Devices featuring AKU 3.0 onboard will become available at the turn of October. For most of older devices, AKU 3.0 update pack ill remain unavailable. Updating and enhancing of any operating system are the things that seemingly will never stop. Groundbreaking changes get introduced in case a company is about to shift up the version of its OS, like it happened to Windows Mobile 2003 upgraded to Windows Mobile 5.0. However, when various fixes are many, but at the same time they cannot constitute a new version, already existing operating system obtains a suffix, indicating its advanced capabilities – for instance Windows Mobile 2003 Second Edition. Minor tweaks tend to pop up frequently and aim mostly at patching up actual version of operating system. In Windows Mobile’s case such updates go by the name of Adaptation Kit or Adaptation Kit Update (or simply AKU abbreviation, which we will use throughout this review) – they usually patch up existing bugs and enable several new features. Each newly released AKU pack retains fixes found in previous versions of AKU, so in order to emphasize the most crucial fixes carried by AKU, the company sometimes turns to Feature Pack (FP) term, adopted from S60 platform. Significance-wise, Nokia S60’s FP and Windows Mobile’s AKU are on a par with each other, thus FP term applied to Windows Mobile has more of a marketing move rather than actual necessity in it. Before the release (expounding this in Microsoft’s own terms - release to manufacturing or RTM), each AKU undergoes stages of alpha- and beta-testing within Microsoft and manufacturers (OEM/ODM). Once the partners have received the final (RTM) version of an update pack, it takes them at least 120 days to embed it in new devices, and it can’t be helped, for Microsoft needs these 4 months to fix critical errors and tackle missing functions. 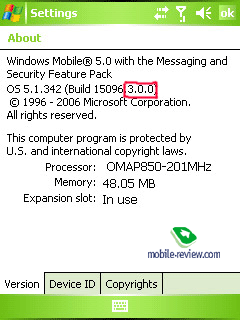 Just remember how long Windows Mobile 5.0 was getting to the first widely available device. In this article we will review all released to date AKU versions for Windows Mobile 5.0 in order of appearance. On the whole, majority of changes incorporated into each pack are related both to WM for PPC and WM for Smartphone – in these cases we won’t make any comments, however should an update be specific for either WM for PPC or WM for Smartphone only, you will see a special note standing next to it. Our readers had the chance to look into the brand-new Windows Mobile 5.0 with the help of the world’s first review published on our page and today you are going to learn more about AKU 3.0 at first hand as well. But as we’ve promised a few lines above, the review starts with the very fist AKU versions. How to find out which version is installed on your smartphone/communicator? Very simple – all you have to do is call up About window (Start/Settings/System), the last three digits (look like x.x.x) indicate AKU edition used on your device. However in this review only the two first ones will matter. Being a part of the very first updates wave, these packs focus on patching up errors of the original WM 5.0 (for example impossibility to make an emergency call when the device is locked). In their turn, manufacturers have acquired insignificant (from the point of view of end-users) possibilities, such as editable Help files (Pocket PC), control over default wallpapers transparency (Pocket PC), and ability to switch off auto words completion. As you see, alterations are so minor, that end-users could hardly notice that there were any at all. This update pack shows off loads of new features and patchworks, especially on the imaging front – owing to the developed features the corresponding application’s functionality has been greatly extended. Nevertheless manufacturers of gadgets which actually hit the shelves of retail stores give more preference to own interfaces and thus all Microsoft’s efforts have ended up being overlooked. One of the most notable additions for WM for Smartphone platforms lies in landscape screen mode support (which was quite predictable, since back then announcement of Moto Q was not too far-out). Another update for smartphones is the possibility to manage these devices without a SIM card – before a plugged in SIM was a must in order to start up a phone. There are also some other steps taken towards unification of Pocket PC and Smartphone platforms. Messaging part has gotten tuned a bit as well – checking for incoming mail at defined intervals can be assigned to all mailboxes set up in Outlook Mobile. Before, users were at liberty to make only one mailbox retrieve mail on schedule – all other accounts were to be managed manually. On top of that, the developers have added sorting by message type (for instance, in order to move apart SMS and MMS), however that tweak proves to be completely useless, when a manufacturer applies special folders for SMS and MMS. 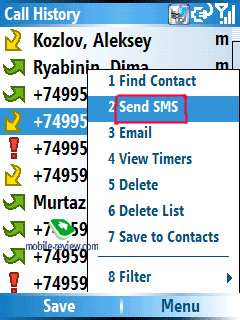 One more extra feature for smartphones makes it possible to dial, save in the phonebook or send a SMS to a telephone number received in a message’s body and all that without leaving “View mode”. Surely, it is a really handy function. Smartphones’ call logs have gotten amplified with the capability to send a short message or MMS to any record found on these lists. Nevertheless it is only the way everything was meant to be, in reality MMS gets replaced with E-mail, even for telephone numbers missing in the phonebook. 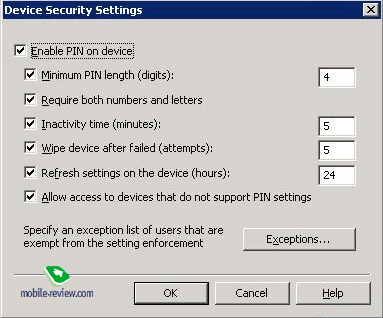 Pocket PC platform has been provided with FDN (fixed dialing numbers) feature, requiring PIN2 code – it allows limiting telephone numbers which users can call and send messages to. 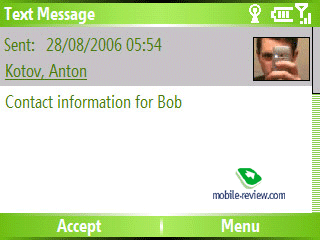 This function had been available on ordinary phones back then, but for some reasons it made it to Windows Mobile powered communicators a bit later. When alarm clock is turned on, Today screen displays a corresponding bell-looking icon near time and date. 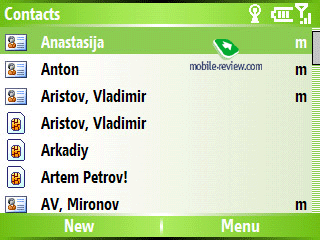 Pocket PC are now empowered with a full-fledged SIM contacts support, which are shown in the end of general contacts list and can be moved to the main phonebook. 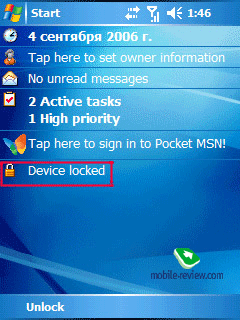 Function keys lock has been added to Pocket PC software shell too. And the last, but not the least addition to the interface – should you reach the end of a list (contacts, messages stored in Inbox) after scrolling through the last item, you will be redirected to the list’s beginning, whereas before the only option was to scroll it all the way back. Next update packs enables manufacturers to turn this off. This update pack targets mostly at increasing performance of wireless connectivity. Nominally, from this update onwards, AD2DP Bluetooth profile, transferring stereo-sound to a special Bluetooth headset without using wires, is officially supported, however in practice support for A2DP profile was disabled by default (it was rather a daring experiment and mediocre quality just proves this theory) – many manufacturers haven’t included it into new devices. Another boost of Bluetooth is capability to synchronize contacts with Bluetooth-powered car kit. Wi-Fi connectivity has undergone a lot of minor changes – for example now user is shown the access point he is currently using, whether it is secure or not. 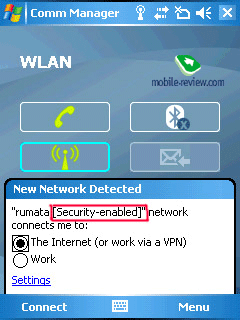 Once a device tracks a new Wi-Fi access point, the pop-up notification displays its safety status – protected networks are market with a lock-looking icon in the general list; but in case you think it is too much of information, you can turn prompt windows off. Further more, the developers have taken care of numerous bugs regarding Wi-Fi performance. This update pack also delivers official hard drives support (the Korean manufacturer had to make it work without this feature on its Samsung i300). Another fetching addition – fast screen rotation for Pocket PC only. This AKU comes included with the infamous Messaging and Security Feature Pack (MSFP) – since the magnitude of this software kit has grown important for Microsoft’s target audience, the company had nothing to do but embed it in AKU 2.0. The next point of interest concerns the audience this update aims at – before the release one of alternative titles used inside the company was Enterprise Feature Pack. As the name implies, enterprise users are the ones who should squeeze most out of this AKU. 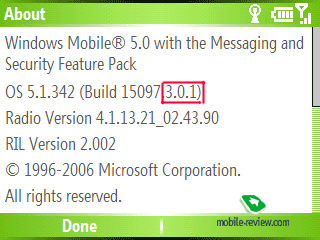 The major innovation provided in this update pack is support for Always Up to Date version 2 or briefly AUTDv2 (the very first version involved SMS messages as notifications coming from the server), which is more widely known as Microsoft Direct Push Technology. 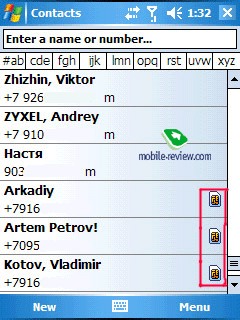 To put it simply, this function works in the following way: if a mobile device has established a permanent connection to a server (MS Exchange 2003 SP2 is required), then as soon as new data gets to the server (new letter, contact, or alteration in schedule), it will be immediately sent to the mobile device without burdening users with checking out for updates manually. In a nutshell, owing to this feature you will be able to keep yourself updated on all recent happenings. It might sound strange, but a smartphone/communicator at permanent GPRS/EDGE connection lasts not for several hours, but several days instead – overall lifetime depends on concrete model. But in the end it still makes an impressive total, especially with Direct Push being switched on (for example from 9 AM till 6 PM). Naturally the application has been attuned to mobile devices, as data there is beamed over cellular networks. For more speedy transfers the tool applies GZIP compression, for less synchronization time – special «connection caching» utility. Support for Secure MIME (SMIME) is also included, so that users are now capable of reading signed and cipher messages. Further more, enterprise users can conduct search for contacts and addresses in a corporate contact book (Global Address Book Lookup, GAL). Remote device security management allows MS Exchange administrators to set password requirements, block a device, and wipe important data that might harm the company’s business without having the corresponding device at hand. Short note. Whether to enable Direct Push via Wi-Fi or not – it’s up to manufacturer to decide. Nonetheless, «Enterprise Feature Pack» definition cannot give you an idea of all improvements that AKU 2.0 brings inside – there are still many interesting aspects to tell about. Many of you will be greatly surprised, but Internet Explorer Mobile found in AKU 2.0 has been significantly re-worked. Even though the main part of the update offers various types of patchwork, there are some new functions as well, like accelerated scrolling and Fast Back feature, support for compiled WML, WMLScript over HTTP and enhanced DOM standard. Smartphones have obtained frames support; keys “2” and “8” now serve for Page Up/Down purposes. The update pack also carries Wireless Manager application for handling wireless connections – with its help you can quickly turn on/off Wi-Fi/Bluetooth/Flight mode, in other words it’s a multifunctional switch, where users may also access Wi-Fi/Bluetooth settings outright. SIM Toolkit. SIM-menu for operators, proposing a standard feature list – before manufacturers had to deal with third-party solutions. Similarly to what we saw in the previous update pack for smartphones, Pocket PCs can now process a telephone numbers received in a message’s body, submit it to the phonebook as separate entries or send a message to them. This update pack also includes a feature which doesn’t appeal to many experienced Pocket PC users – instead of clock in the top status bar, we now see battery level indicator. However it is changed in AKU 2.2, where users are at liberty to choose what they would like to see in the top right corner of display. Smartphones have acquired a bundled file browser – previously they made use of a third-party application. According to its title, it performed all basic operations with files, but couldn’t offer something more. The only notable feature of this update is dynamic switching between screen modes (landscape and portrait). Compatibility with ActiveSync has been gotten better owing to the advent of ActiveSync Serial Switch utility. New ActiveSync 4.x has been initially set to use the RNDIS transport layer, but now you are granted the freedom to switch back to the old way (applied in Windows Mobile 2003 and earlier releases) in case you’re experiencing issues with pairing the device up with a PC. The developers have also managed to cut down time required for starting up Pocket PC by 15 seconds on average due to amplified caching algorithms. All other alterations are either beyond attention or target at patching up bugs. This AKU can boast only patches for existing errors – new functions and features don’t stand out too much, so we have almost noting to tell about the 2.3. And this is another “feature-less” update; at least it contains nothing deserving a special note. We can point out only SmartDial from the Today screen for QWERTY-equipped smartphones and the option enabling manufacturers to change dialing font color (Samsung’s influence?). The only more or less noteworthy change found in this AKU – zooming (up to 2x) for video clips played back in Windows Media Player. So, we have finally made it to the latest update pack available, also known under the name of Venti. It retains a number of really crucial patches and tweaks, which we are going to dwell on. In fact, finding out whether your device is running on AKU 3.0 or not is incredibly simple – at start up you will see “Windows Mobile Direct Push Technology” against green background, this is actually all another way of laying stress on MSFP’s presence. Moreover, About window now features a note regarding availability of Messaging and Security Feature Pack as well. We’ll start reviewing this AKU with new specific functions and features. And .NET Compact Framework version two (instead of ver. 1; feature can be customized by a manufacturer) is the one at the frontlines. One of the best things about AKU 3.0 is so-called Language Provisioning, enabling local manufacturers to add as many languages to a device as its onboard memory can store (at that every dictionary takes up from 6 to 12 Mb, depending on given language). However the bad thing here is that language can be chosen only once, after that all other packages are deleted automatically, even hard reset won’t change the system’s mind. Thankfully, manufacturers can disable that and keep all language packs on the main storage permanently, so that users could switch languages after hard reset. All in all it’s a very important piece of work, even though hard reset is still a must for changing language. Wireless connectivity has also received a major boost – an all-round new Internet Sharing utility replaces Modem Link, and allows accessing Internet via Pocket PC or smartphone with the help of USB/Bluetooth connection. On top of that settings are one-sided, which means that you will have to adjust only your mobile device, while your PC should only have support for Bluetooth network profile onboard, at that Windows Mobile-powered device doubles as a Bluetooth access point rather than a remote modem. In a nutshell, all you have got to do is establish connection to the access point without any additional settings being required (for example Access Point defining, which was inevitable on connection via Bluetooth DUN profile). 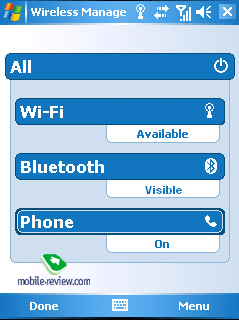 New Wi-Fi connection wizard for smartphones helps a lot in configuring new Wi-Fi networks. One of the most crucial improvements is support for WPA2 – the most secure Wi-Fi standard for the time being. However the developers have seemingly decided to give Wi-Fi all their efforts and embedded Wi-Fi Multimedia, also called Wi-Fi Quality of Service (QoS), which allows access point to modify bandwidth limit for each application – a really credible tool when it comes to IP-telephony and streaming multimedia applications. Bluetooth connectivity has gotten enhanced as well: from now on it supports FTP profile, better handles A2DP, whose quality gave rise to criticism lately. Outlook Mobile has been modified as well – on first start up the system offers you to setup e-mail (POP3/IMAP or Exchange) step-by-step via a special wizard, whereas before it proposed only time and security settings. At that both manufacturers and operators can pre-define settings for most popular mail services and thus lighten the rest of work to do. 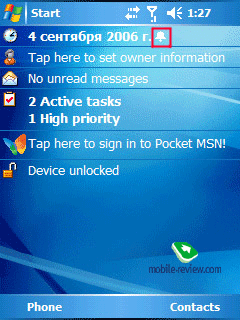 From now on it’s possible to navigate Pocket PC’s folders containing messages without drawing your stylus. Previously, inability to browse folders via menus was only of the greatest flaws of single-handed management of Windows Mobile 5.0-based devices. Contacts can be now transferred via SMS (in vCard standard), and should you retrieve a short message containing a phonebook entry, you will be immediately offered to save it into your contacts. Short messages can be saved on SIM-card. 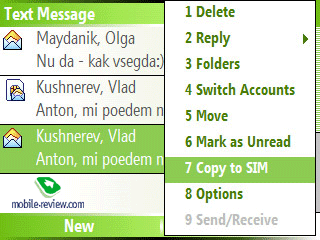 Messages stored on SIM-card are displayed in general list of messages. You can now send messages via GPRS (SMS over GPRS), but for that you will have to make sure that your cellular operator offers support for this function. Support for contacts stored on SIM-USIM card has been improved. From now on SIM card contacts are sorted by Name in general contacts list, instead of being placed into bottom of list as it used to be. In my opinion this is not so convenient, especially in case you have loads of contacts and they are partly backed up on SIM-card, in other words you will end up handling duplicated entries. It would have been better to make this feature optional. We should also highlight fact that support for external displays has been added officially. As an experiment (function is still rather crude, but this will most likely be fixed in future) you can now assign MP3 ring tones to all events including SMS and reminders. Yet, it’s unknown whether this feature will be implemented into final release or not. Throughout AKU’s history for Windows Mobile 5.0 we see how treatment of “infantile sicknesses” (it took years for Microsoft to realize that MP3 ring tones should be allowed for assignment to SMS and others) and correction of bugs have been initiated simultaneously with empowering the OS with new features, such as support for Microsoft Direct Push, WPA2, Language Provisioning and greatly improved Internet Explorer Mobile. Nonetheless the most interesting part of the WM’s history is yet to come with the release of Microsoft Windows Mobile Crossbow (possible commercial title – Windows Mobile 5.0 Second Edition). One of the upcoming articles on Mobile-Review.com will be dedicated to this matter; our readers will be able to find out what WM Crossbow is all about several months ahead of its actual release.